Sprite animations are basically untested so will certainly be somewhat funky. Any chance of a CC0 license on this one? Not without some incentive. A significant amout of work went into this. I'm not in the habit of feeding the parasites. I'd happily put some money towards it. Or, did you have another incentive in mind? So cool! You make this stuff look easy. If you want to make a significant contribution to the commons (art, code, whatever), can demonstrate significant past contributtion to the commons, or make a significant donation to OGA or some other worthy cause (I have little interest in money personally) then I would probably find it agreeable. I wasn't trying to 'force' you to change the license. I noticed that you seem to typically release your stuff as CC0, or the stuff I've checked out, and was wondering if there was a reason this was different. You know what they say... If you don't ask, you'll never know. And, of course, I love your stuff man! Am I the only one that thinks surt is being kind of disrespectful to cdoty? cdoty just asked a question and directly answered surt's requirements with what he thought might merit a CC0 license and then surt derisively brushes it off with a "Yeah, whatever". That seems like a bad attitude to encourage others to ask meaningful questions around here. Did I miss something or was surt being disrespectful? I give the guy what he asks for and you accuse me of being disrespectful? Maybe you should look in a mirror. This place really needs an eye-roll smiley. He didn't brush it off - he relicensed to CC0 as requested. I read that more as a "*shrug* Works for me" type of deal. Hence my asking the question: "Did I miss something...?" And I wasn't the only one wondering... so no need to get defensive, surt. You may have given him what he wanted, but you don't need to be facetitious with people who are asking questions (in this case my question, not the original). MoikMellah, thanks for the thoughtful response that clarified my question. That's the kind of response that will lead to more open community. I see now that I misread the original comment. Maybe there is a way to stop feeding the parasites, give back to OGA, and allow people to get the artwork under a less restrictive license. Place a Paypal donate button with each asset, if the original author approves it. License the asset based on a minimum donation, set by the author, for CC0. Attach an ID to the asset, and include the asset in the Paypal transation description. People wanting CC0 can give back to OGA, and shed the unwanted parasite label. Of course some people will try and abuse this; but they're probably the same people that wouldn't worry about the license in the first place. These folks still retain the dreaded parasite label. The artwork retains the provided license for everyone else. That sounds like an interesting way to go about it. But the way surt when about it also seems like an interesting approach: require that the person have contributed art/music/code in order to consider it. why did you need it to be CC0? crediting the author is too much to ask? I had no clue about CC BY until yesterday, so yes CC BY would've probably been a valid option. Surt could've countered with an offer of CC BY. For me, GPL wasn't an option. I only grab assets that I know can be used in a commercial product, on the off chance that I actually create one. I would hate to accidently leave a GPL asset in a game I developed. And, as you may have noticed from my source releases, I firmly believe that whatever I put out on the internet should not have any strings attached, including license restrictions. So, I typically look for 'stuff' that follows the same principle. I believe this ideal comes from an earlier time where people contributed freely to the common good. For example, have a look at aminet.net, most of the code and assets are in the pubic domain. 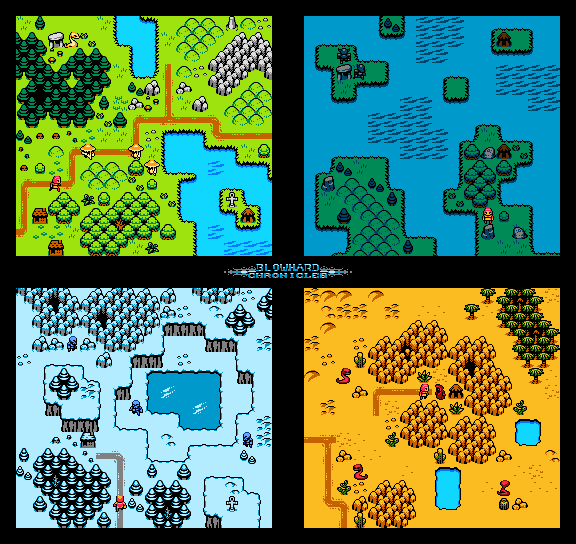 Color combination are awesome on these tilesets. 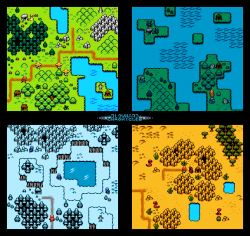 Your tileset is awesome. I could have characters and objects moving in a game environment within a week. How would you like to benefit from that if I do? Chances are, if I get a flash game sponsor for the game, I'd be more than interested in sharing a percentage with you and possibly working with you again. Let me know. CC0 so no need. If you want to then throw some money at OGA or something. Sounds good to me. Will do. I'll mention OGA and yourself in the credits and donate a reasonable amount of what I earn. Thanks for the response. Surt, your stuff is the dopest. You touch a chord. They are wonderful. These look incredible. I'm working on trying to reduce them to 2-bit color. They are NES-spec so they are already meant to be 2-bit colour. Cool, but your PNG doesn't have just four colors in it's index. I figured out that before I can use imagemagick to reduce the number of colors, I have to cut the png up into regions where only one palette is used. I can post four colour versions later today. Thanks so much for getting the 4 color version up! Somebody is using this for: '8 bit live wallpaper' in the Google Play store. I noticed the art as soon as a saw it. Seems neat.